Pets and Substance Abuse: Does Animal Assisted Treatment Work? Overcoming Substance Abuse: Can Animals Help in Addiction Treatment? Beating an addiction to drugs or alcohol requires a multi-pronged approach. Animal-assisted therapy is a unique treatment modality that is used in conjunction with other therapies to help recovering addicts undergoing addiction treatment. Trained therapy animals have also been found to be successful in resolving co-occurring mental health issues, such as aggression and anxiety. Is animal-assisted substance abuse treatment effective? How can pets prevent addiction? Let’s find out. Can Pets Help Prevent Addiction? Can Pets Help Treat Substance Abuse? What is Animal-Assisted Addiction Treatment? Is Equine Therapy Helpful in Treating Substance Addiction? What is the Role of Dog Therapy in Addiction Recovery? How Can Cats Help in SUD Treatment? How To Choose the Best Animal-Assisted Addiction Treatment Program? Staying Sober: Can Pets Help Prevent Addiction? Ask any of the nearly 85 million American pet owners and they’ll tell you that the company of animals has innumerable benefits. The calming purr of a pet cat or the ecstatic welcome from a beloved canine friend can lift a person’s mood in an instant. Research has shown that human-animal bonding can reduce anxiety, lower agitation, and improve overall health and wellbeing. Pet-facilitated therapy has shown benefit in relieving distress in cancer patients. But can pets help prevent substance abuse? According to the National Institute on Drug Abuse Preventing Drug Use Among Children and Adolescents survey, certain people are at higher risk for drug abuse than others. Aggressive behavior in childhood, substance abuse by peers, easy availability of drugs, lack of supervision or family involvement and bonding predispose a person to addiction. Young people, children of drug abusers, and individuals with co-occurring mental health disorders are high-risk groups. 2013 Developing and Validation of Identifying People in Risk of Addiction Questionnaire shows depression, stress, anxiety, and a negative attitude all play a role in an individual’s risk of addiction. People with negative feelings such as stress and anxiety are more likely to be impulsive or irrational, putting them at risk of substance abuse. So, how can having pets at home help prevent addiction? People who experience negative emotions, such as anxiety, guilt, shame, and loneliness, are at a higher risk of substance abuse. Unconditional love from a beloved pet has a calming effect, reduces the sense of isolation, and encourages a positive attitude to life. Studies have shown that playing with a pet can boost mood by increasing the levels of dopamine, serotonin, and oxytocin, chemicals that stimulate the pleasure centers in the human brain. Animal interaction has also been shown to reduce the level of cortisol, a hormone that is related to stress. People use drugs to feel good. A pet is a healthy way to experience the same positive emotions and mood. Petting a dog or cat is known to reduce blood pressure and have a calming effect. In fact, one study found people with pet dogs and cats have a more stable heart rate and blood pressure during stressful situations than non-pet-owners. Stress is a well-known risk factor for developing substance use disorders. The ability of pets to help people handle stressful situations therefore protects against addiction. Lack of discipline is a risk factor for substance use. Pets help people learn many life skills including developing a sense of responsibility and reducing impulsivity. Pet owners are responsible for another living being other than themselves. This promotes accountability and restraint and helps prevent addiction. A dog needs to be walked regularly. A cat may insist its owner chase a string in the backyard. Owning a pet gives cause to exercise and maintain a daily routine. This leaves less time for the pet owner to hang out with the wrong company or engage in unhealthy habits. Pets help prevent substance abuse by promoting healthy habits and good lifestyle choices. Pets and Addiction Treatment: Can Pets Help Individuals with Substance Use Disorders? According to the 2014 study by Kamioka and Okada, animal interventions with dogs, cats, horses, dolphins, birds, rabbits, and guinea pigs are an effective treatment for alcohol and drug addiction and mental health disorders such as depression and schizophrenia. You could say pets make excellent therapists. Interaction with animals is known to heal broken bodies and minds. Specific research on animal-assisted treatment for addiction is limited, but the Department of Psychology of Emory University research has shown impressive results with a variety of animals, ranging from common household pets (dogs, cats, and horses) to exotic animals (dolphins and elephants) helping in the treatment of a number of psychological maladies. A 2016 study by Dr. Lindsay Madden Ellsworth of the University of Washington confirmed the benefits of animal interaction during addiction treatment. The study found reduced hostility and sadness in adolescent boys who underwent weekly 1-hour sessions of human-dog interaction during inpatient treatment for substance abuse. The author of the study concluded animals are a big asset in addiction recovery. Animal-assisted therapy for substance use disorders is an umbrella term for a number of therapeutic and recreational activities that harness the healing power of animals. People in addiction treatment programs can benefit from the human-animal bond to assist them during their recovery. The dynamic and mutually beneficial relationship between people and therapy animals has a positive influence on the recovering addict’s overall health and wellbeing. How does animal-assisted therapy help recovering addicts? People with addictions to drugs or alcohol face many physical, mental, and emotional challenges. The neurotransmitters and receptors in their brains are accustomed to being artificially stimulated with drugs and alcohol. Therapy animals offer a safe and natural way to stimulate pleasure receptors in the brain. These animals also help the recovery process by encouraging the recovering addict to develop healthy bonds and become accountable for someone other than themselves. Animal-assisted therapy (AAT) is not a stand-alone addiction treatment and it cannot replace evidence-based treatment modalities such as detox and counseling. AAT is offered as part of a holistic recovery program. It is a goal-oriented, structured, and planned intervention. A specially trained healthcare provider (physician, physical therapist, social worker, or mental health professional) supervises a therapy animal. Activities usually focus on social skills, motivation, and other addiction recovery goals. Which animals usually participate in therapy for substance abuse? The most common therapy animals are dogs and horses, but other animals such as cats, rabbits, guinea pigs, and birds may also be beneficial in addiction treatment. There are even reports of people using ducks and llamas for animal-mediated addiction treatment. There is no specific research that compares the effectiveness of different animals in people with substance use disorders. 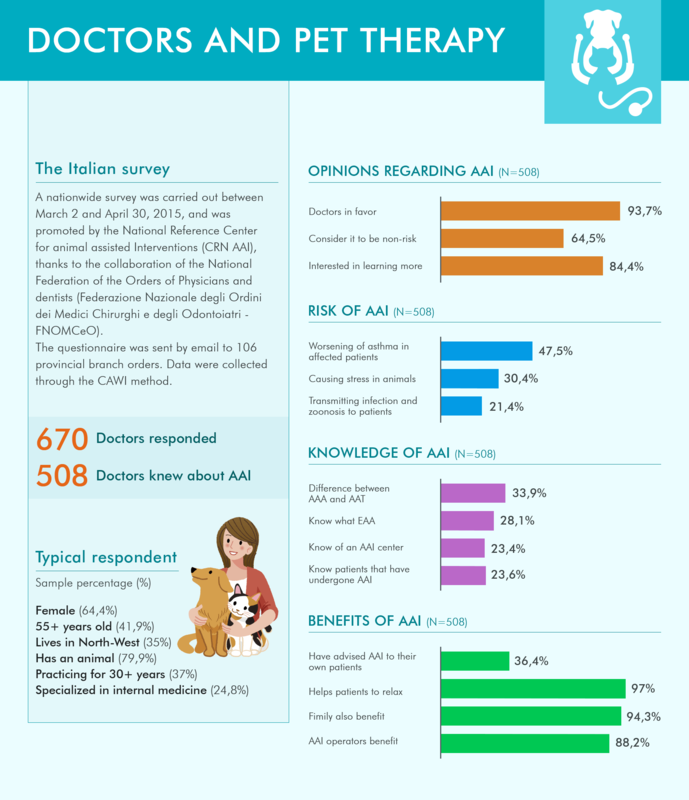 Researchers believe most therapy animals are equally effective. nteractions between a recovering addict and a therapy animal under the supervision of a trained healthcare provider strengthens the bond between the patient and the provider. A strong working relationship between patient and provider is a good predictor of positive outcomes. The therapy animal helps the patient develop mindfulness and overcome emotional dysregulation. AAT has been shown to boost mood, confidence, and communication skills, all of which are beneficial in the path to recovery from substance abuse. Animal-assisted therapy is also useful for people with co-occurring mental health disorders such as PTSD. Animal-assisted therapy improves compliance and increases the chances of the patient completing addiction treatment. Higher cortisol hormone levels in response to stress are associated with higher treatment dropout rates in drug users undergoing residential substance abuse treatment. Pets and therapy animals reduce stress and scientists believe that animal-assisted activities, either in the form of casual interaction with pets or through structured addiction recovery programs, can benefit people with substance use disorders. Where to get animal-assisted therapy for addiction? Many drug rehab facilities offer animal treatment as part of a comprehensive addiction recovery program. In addition, there are associations and organizations that specialize in animal-assisted therapy. Volunteers work with patients and therapy animals under the supervision of healthcare providers. Pet Partners, a leader in animal-assisted interventions, was founded in 1977 and has been providing therapy with dogs, cats, horses, pigs, guinea pigs, birds, alpacas/llamas, rats, and rabbits for the last four decades. Volunteers pet owners are put through a handler course and a veterinarian check is performed on the therapy animal to confirm good health. Animal Assisted Intervention International is a non-profit organization that supports activities, programs, training, handling, and education for positive interactions between animals and people. The organization’s website has a search tool for therapists around the world. Canine Therapy Corps provides free animal-assisted therapy services in the Chicago metropolitan area. The focus is on harnessing the strength of the human-animal bond through goal-directed interactive programs. This helps people in recovery overcome personal challenges. Therapy dogs work as a team with volunteers and provide motivation and positive feedback during sessions. Substance Abuse Recovery: Can Equine Therapy Help? Equine-assisted therapy is a type of animal-assisted therapy in which horses are an integral part of the treatment process. Horses can help recovering addicts work through their emotional and psychological issues which led to substance abuse. Interestingly, some of these issues are not addressed by traditional psychotherapy. Equine-mediated treatment is offered as a complementary therapy to traditional modalities such as detoxification and psychotherapy. Horse-facilitated activities are growing in popularity as a therapeutic modality for people with substance use disorders. This treatment approach requires recovering addicts to regularly perform a variety of mutually beneficial activities involving horses, including riding, handling, grooming, walking or trotting, and lunging (training) these animals under the direction of a licensed mental health professional with credentials in equine-facilitated therapy. Why is equine-therapy considered effective for addiction treatment? Horses act as healers for people in recovery. They respond to feelings such as anger, happiness, sadness, and nervousness. People going through addiction treatment receive immediate feedback from the horses during therapy sessions, helping them understand many underlying emotions they were previously unaware of. Recovering addicts learn to interact with others in a healthy way and build trust. 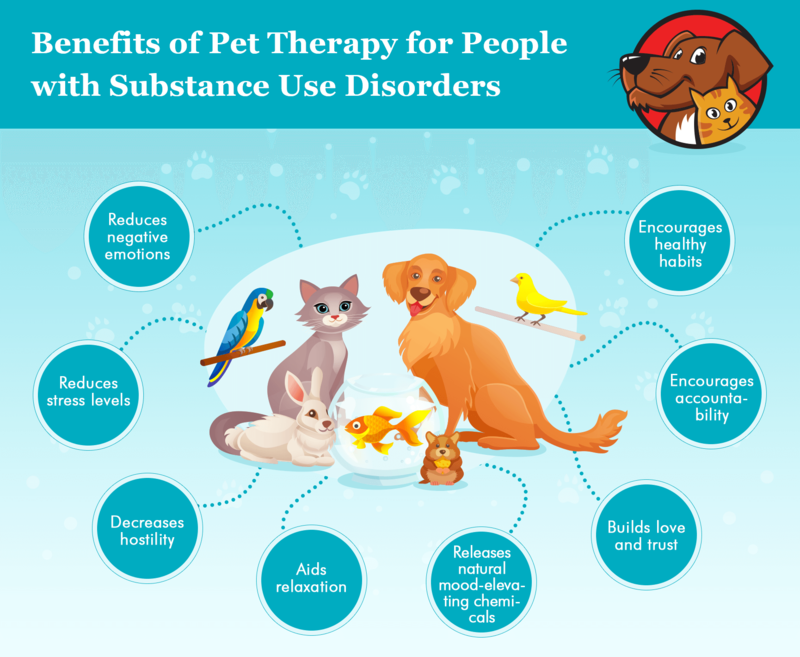 Individuals battling drug and alcohol addiction are able to develop a deep connection and feel a sense of acceptance from the therapy animal. The horse serves as a mirror, a metaphor, and a means of self-reflection. This type of therapy offers a chance to build attachments with a safe, non-judgmental partner. Addicts develop a positive relationship without fear of criticism, which aids the recovery process. Interaction with horses may open up conversations with the therapist about psychological and social issues that led to the person’s addiction. Equine therapy is particularly effective in individuals with complex mental health disorders such as depression, PTSD, and substance abuse. Improved self-esteem and the ability to deal with challenging situations are traits that can help recovering addicts get clean and stay clean. According to the recent research on animal-assisted therapy with farm animals for persons with psychiatric disorders, animal-assisted therapy involving farm animals such as horses greatly improves coping abilities and self-efficacy in individuals with psychiatric problems. Substance abuse and mental health disorders often co-occur, suggesting that equine-facilitated activities are effective in people undergoing addiction treatment. Horse-assisted therapy is frequently offered as part of experiential rehab for alcoholics and drug addicts. Horses bring unique qualities to the therapy sessions. Interactions between recovering addicts and horses allow the formation of healthy relationships and nonverbal awareness. However, equine-assisted therapy is not suitable for everyone. For instance, it is not recommended for anyone with severe asthma or an allergy to horses. It is also not suitable for people who are unable to walk on uneven ground or cannot lift, push, or pull more than 20 pounds. Dogs are the most commonly used animals in animal-facilitated treatments for people with substance use disorders. Therapy dogs are gentle, calm, interactive, and highly observant. They can be trained in agility and obedience. This makes them ideal for addiction therapy. 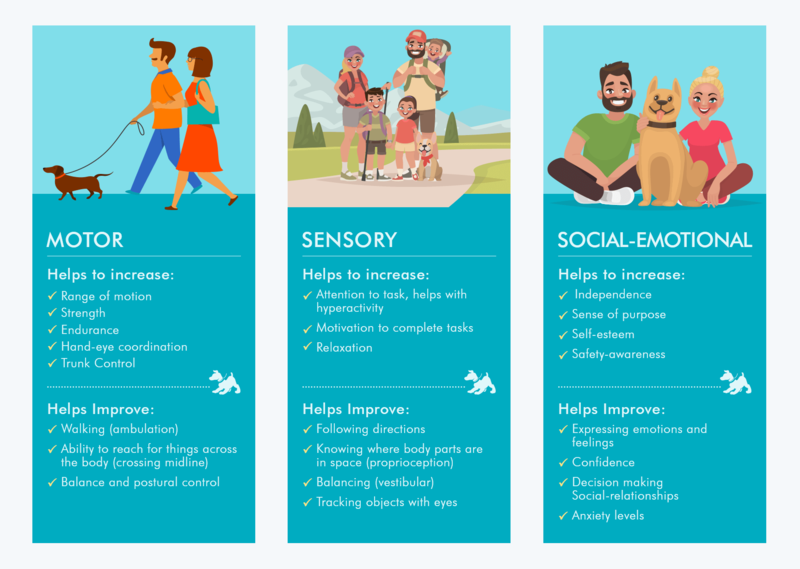 Dog-assisted activities include physical and verbal interactions such as feeding, talking, grooming, petting, training, and playing with the animal. Canine-assisted addiction treatment is effective because interaction with the dogs helps clients open up about their history of substance abuse and the consequences of alcohol and drug use. Dogs help recovering addicts develop trust, establish boundaries, and gain self-esteem. They improve problem-solving and communication skills. During sessions with dogs, people struggling with addiction learn to relate to others and overcome emotional and physical distancing, which is extremely important during interactions with new support networks for sobriety such as 12-step meetings. Recovering addicts develop interest, focus, and motivation. This positive attitude as a result of canine-assisted therapy sessions is greatly beneficial in the recovery process. Observing an addict’s interaction with dogs helps therapists to identify unhealthy coping mechanisms and educate the client on better choices, thereby reducing the likelihood of turning to drugs or alcohol in response to life’s challenges. 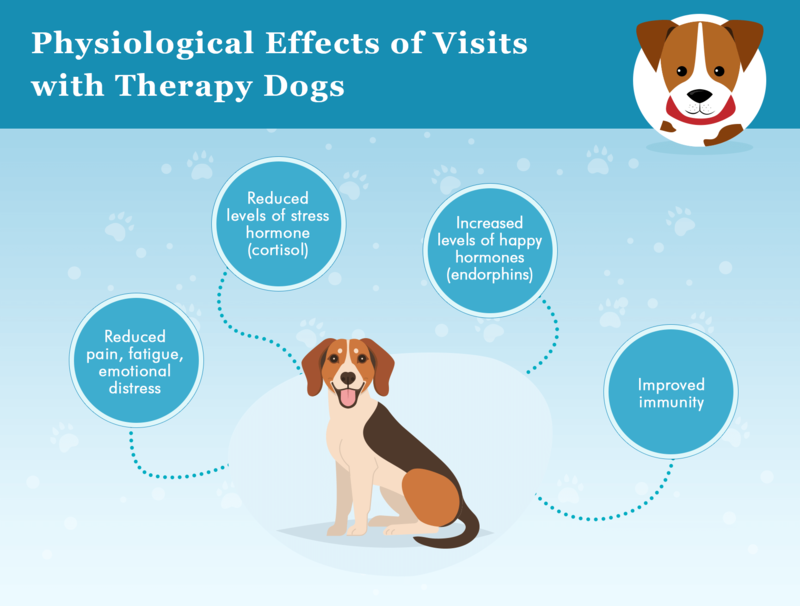 Research shows that dogs lower stress without compromising traditional therapeutic mechanisms and improve long-term outcomes of psychotherapy, including cognitive behavioral therapy which plays a major role in addiction treatment. Interaction with therapy dogs helps reestablish the natural neurochemical pathways in the brain. During therapy sessions, the release of a powerful neurotransmitter, dopamine, mimics the effects of an amphetamine or cocaine high. Other mood-enhancing chemicals, such as oxytocin, serotonin, and endorphins, are also released during human-dog interactions. Dog-assisted therapy is a healthy, sustainable way to experience positive emotions and develop good habits and routines. Ultimately, all these behaviors help reduce dependence on alcohol and drugs. Dogs who are social, well behaved, calm, friendly, and gentle make the best therapy animals. Other desirable traits include being adaptive to different noises and smells and training in basic obedience Certain breeds, such as Labrador Retrievers, Pugs, Golden Retrievers, Poodles, and Beagles make excellent therapy dogs because they are intelligent, affectionate, and have a gentle temperament. Should a recovering addict undergo supervised animal-assisted therapy or adopt a pet? Let’s look at the pros and cons of both. These animals are available for short sessions with patients undergoing inpatient rehabilitation as part of a prescribed addiction treatment plan. Volunteer owners with training and certification accompany the animal to the rehab facility. These dogs undergo regular health checks and are clean and well-groomed during visits. They offer recovering addicts a chance to spend time in a supervised setting without the full-time responsibility of caring for an animal. People who are able to adopt and care for an animal of their own can consider getting a dog as a pet. Pets provide around-the-clock companionship and unconditional love to people in recovery. Individuals with a history of substance abuse and co-occurring mental health conditions can benefit from having a canine companion at home. ASPCA.org and the Humane Society are good resources to find locally available dogs for adoption. It’s important to remember that dog-assisted addiction therapy is not appropriate for everyone. For example, someone with a fear of dogs, an allergy to dogs, or cultural concerns regarding these animals may not benefit from this treatment. Clients cannot be forced to participate in such a treatment. During orientation, therapists explain the interactions that will take place and how to read the animal’s body language. Recovering addicts are also taught appropriate ways to handle the dogs and what parts of the animals may be touched. Clients are not permitted to provoke, intimidate, or hit a therapy animal. While dogs are the obvious choice for animal-assisted therapy, feline therapists have their own advantages. These soft, furry animals make excellent companions as house pets and benefit people undergoing addiction treatment. The presence of cats during therapy sessions has been shown to reduce depression and anger and improve attention and social skills, all of which can help a recovering addict on the path to sobriety. How can cats help individuals in recovery? Interaction with a cat can calm the nerves and improve mood. Human-feline interplay releases serotonin in the human brain, a chemical that instills a sense of wellbeing. It also reduces cortisol, the hormone associated with stress. Therefore, cats treat stress and anxiety which can predispose an individual to substance use problems. According to SAMHSA, people with mental health disorders are more likely to experience substance abuse and integrated treatment of both conditions is the best approach. Companion animals during drug rehab provide a number of benefits. For this reason, some drug rehab facilities allow clients to bring their pet cat with them. 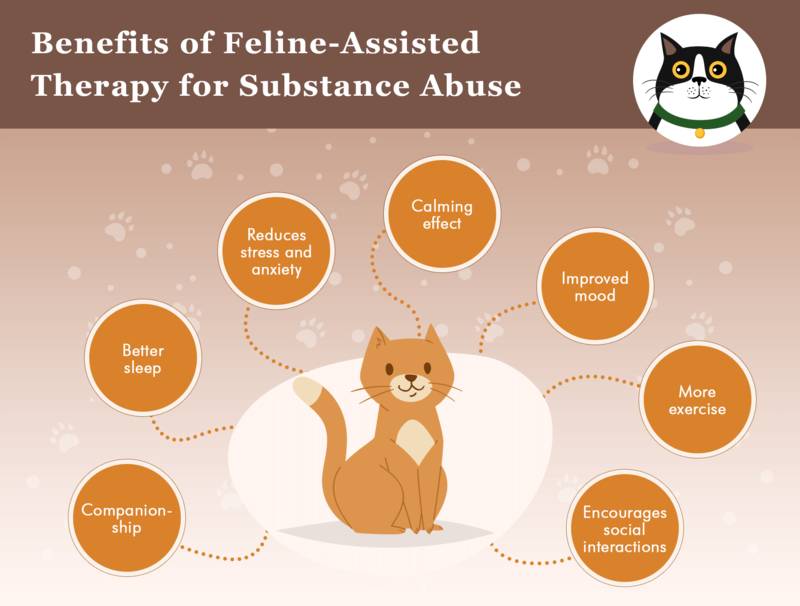 The presence of a feline companion can allow the recovering addict to feel less lonely and more emotionally supported while undergoing addiction treatment. The 2012 study on psychosocial and psychophysiological effects of human-animal interactions has shown that the presence of an animal has a positive impact on a person’s attitude, sense of responsibility, self-esteem, and focus. Interactions with cats during rehab can improve social interactions, help develop trust, and reduce aggression. However, if the particular drug rehabilitation facility does not allow to bring animals to its premises, it is always possible to use a pet camera and check up on one’s animal during the addiction treatment process. What kind of cats are used for addiction therapy sessions? Well-groomed cats with trimmed nails and clean eyes and ears are introduced to clients during therapy visits. Cats that are trained in basic obedience and are comfortable on a leash and in a carrier are suitable for the job. Animals with strong social skills and a friendly demeanor work well with recovering addicts. Of course, therapy cats are comfortable with new places and new people. Legitimate concerns about cat-assisted therapy include allergies, biting and scratching, dislike or fear of cats, and the idea that these animals carry diseases. Cleaning and grooming reduce the risk of allergies. Therapy animals are typically tested for diseases and parasites and put through a temperamental and behavioral evaluation. Nonetheless, feline-facilitated therapy is not for everyone and client consent is mandatory for the comfort and safety of all. Animal-assisted therapy can benefit many people in addiction recovery as part of a broader treatment plan. How do you choose the best program that utilizes therapy animals? Many drug rehab facilities outsource AAT to third-party providers and clients may need to travel to another site to receive these services. It is a good idea to confirm that the animals are well cared for and the providers are trained in handling them to keep everyone safe. The provider’s training and certification in animal-assisted therapy for recovering addicts can serve as an indication of their competency. A good counselor should ensure proper animal behavior and compliance with commands to ensure patient and animal safety. The facility should be appropriately equipped for the types of activities and interactions to be undertaken. Staff at the facility should be knowledgeable about the animals working at the facility and the intent of the activities. Finally, providers should be trained in evaluating whether a particular client is appropriate to participate in animal-assisted therapy. For example, people with severe animal phobias or high levels of aggression may pose a threat to themselves, the animal, and staff at the facility. These best practices ensure a positive and safe experience for all clients. Several organizations including Therapy Dogs International, Love on a Leash, Bright and Beautiful Therapy Dogs, and Alliance of Therapy Dogs, train and certify therapy animals, primarily dogs and cats. These organizations provide training and certification to therapists to enable them to offer effective and meaningful animal assisted therapy. The therapeutic use of animals dates back many centuries. Florence Nightingale recognized the healing impact of animals and Freud noted that the presence of his pet dog in the room helped his patients relax. There are many emotional and psychological benefits of animal-oriented therapy, including decreased anger and loneliness, increased calmness and optimism, and a sense of being loved and wanted. Experiential therapy with animals is known to help recovering addicts feel more comfortable and less guarded and anxious during sessions. Interactions with animals are known to improve sociability, communication skills, responsibility, compassion, and trust. Recovering addicts learn to be less impulsive and develop improved coping skills and problem-solving strategies as a result of these sessions. Many people find that their interactions with animals during substance abuse treatment are transformative. Most recovering addicts report a positive experience with better rapport with their therapist, reduced anxiety, and increased success in recovery. Animal-assisted therapy can be combined with almost any type of traditional psychotherapy. It can be used in a variety of settings, including outpatient drug rehab facilities, private therapy offices, and residential rehabs. As part of a comprehensive drug rehab plan, and when conducted by a trained health provider, animal-assisted therapy can greatly benefit individuals undergoing addiction treatment. This type of therapy can also improve the symptoms of co-occurring mental health conditions and make recovery from substance abuse successful in the long run.